Parts of southern B.C., including Kamloops and Kelowna, were hit with flash flooding, drenching rain and lightning, as a band of intense thunderstorms moved across the region on Wednesday. Many parts of southern B.C. were hit with flash flooding, drenching rain and lightning, as a band of intense thunderstorms moved across the region on Wednesday. One of the worst-hit areas was Kamloops, which was hit with about 25 mm of rain in about 20 minutes, quickly overwhelmed drains and other infrastructure, forcing water and debris onto streets and into homes. Several streets were flooded, stranding many cars and trucks on the roads. At least 8,000 customers lost power across the region because of the storm. 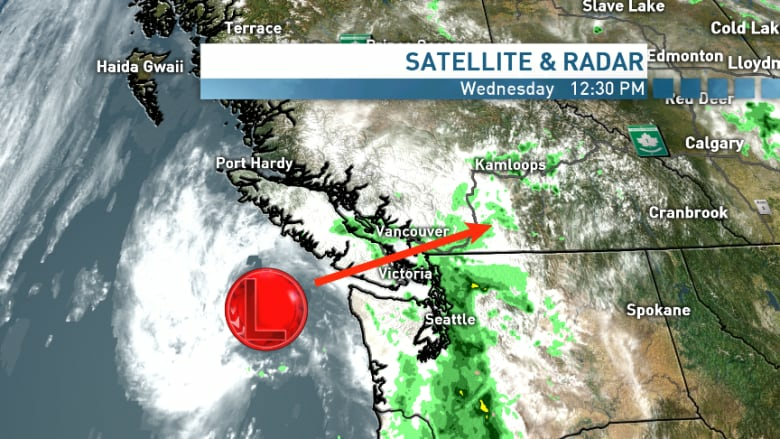 The low-pressure system, which slid up from Washington's coast, will continue to bring heavy rain, dangerous hail and thunderstorms to southern B.C. through Thursday, Environment Canada is forecasting. On Wednesday, Environment Canada posted special weather statements advising that heavy rains were likely to pour down across a wide area including Victoria, Metro Vancouver, the Fraser Valley, the Sunshine Coast, Whistler, the Fraser Canyon, Quesnel, the Columbia region, the Kootenays and the Okanagan. The agency also warned that thunderstorms were brewing for areas east of the Fraser Canyon. 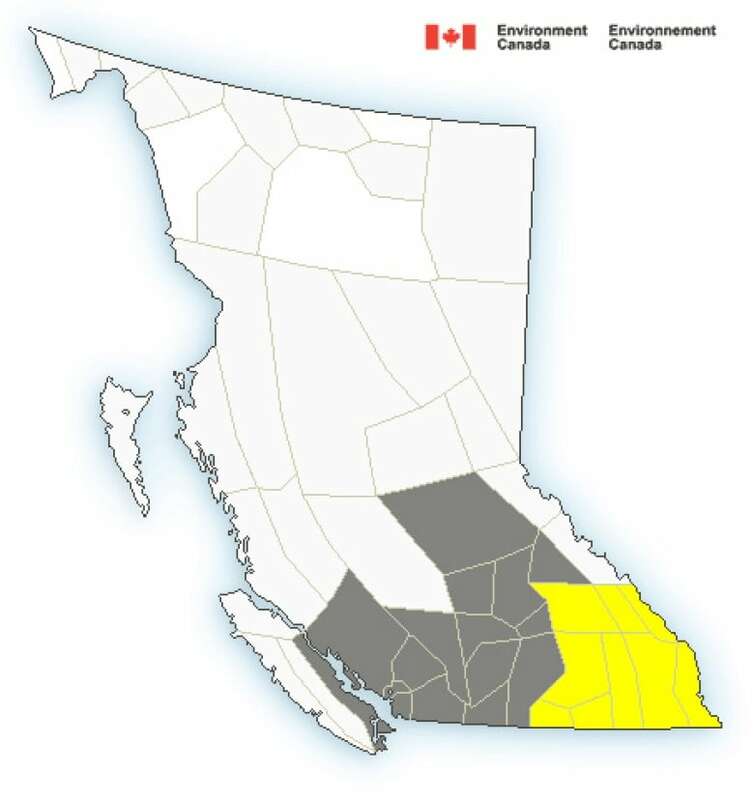 Thunderstorm watches were in effect for the Boundary, Arrow Lakes and West Columbia regions. Environment Canada said that in those regions, "conditions are favourable for the development of dangerous thunderstorms that may be capable of producing strong wind gusts, large hail and torrential rain." Environment Canada recommends people stay indoors in those areas: "There isn't a place outside that is safe during a thunderstorm." 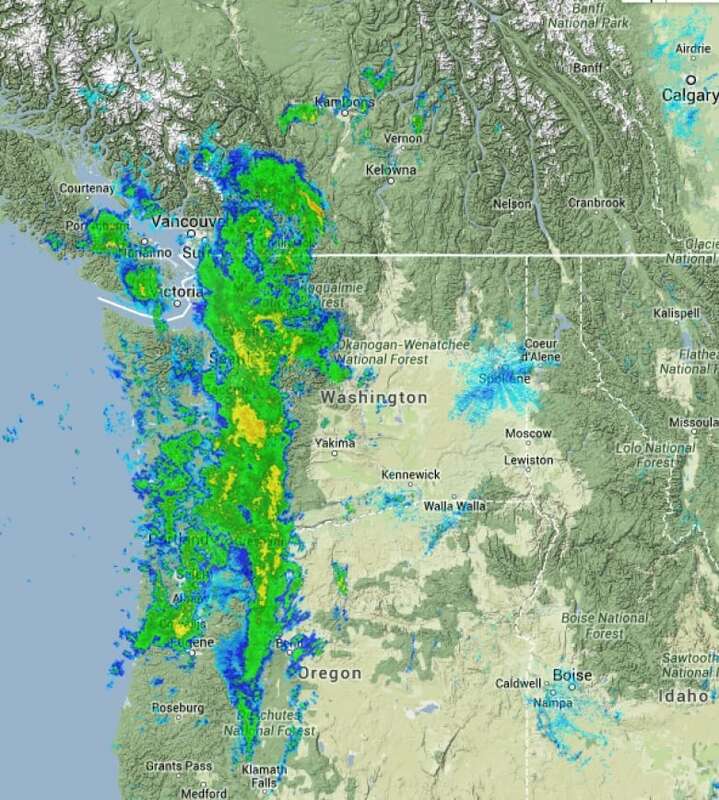 Parts of the Boundary, Kootenay and Columbia regions were expected to see 25 to 50 millimetres of rain falling in under a few hours Wednesday afternoon or early evening. To the west, the heavy rain was thought most likely to hit late on Wednesday night. "Some computer models are suggesting excessive rain that may trigger short-fuse rainfall warnings across the Lower Mainland and southern Vancouver Island later today," Environment Canada said in the special weather statement. In areas where localized flooding occurs, motorists are being warned that fast-moving water across a road can sweep vehicles away. Environment Canada said in those parts of southeast B.C. that may see the heaviest showers, people should avoid rapidly rising rivers and creeks, which can sweep away bridges, culverts, buildings and people.